Joseph L. Ferris graduated from the University of Maine in 1966 and the University of Maine School of Law in 1970. Mr. Ferris was admitted to the Maine Bar and the U. S. District Court, District of Maine, in 1970. He practiced law in Brewer for 44 years before joining Gross, Minsky & Mogul in June 2014. In college, Mr. Ferris was a college baseball player and was named the most outstanding player in the 1964 College World Series. He is a member and past president of the Penobscot County Bar Association as well as a member of the Maine State Bar Association. 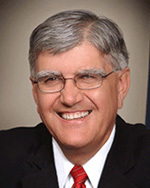 He was mayor of the City of Brewer in 2005 and 2011. He has also served on the Brewer School Board for 8 years and has served on the Brewer City Council since 2002. He currently serves on the Brewer Economic Development Corporation. Mr. Ferris’ practice covers a broad spectrum of law, including transactions, business law, litigations, corporations and estate planning.